I was super excited to finally start reading Three Dark Crowns, as I'm a huge fan of Kendare Blake. Her Anna series is one of my favorites, and while I've had her Goddess War series on my TBR for quite a while now, I haven't yet had the chance to read it. But I was really, really looking forward to reading something new by her, and I definitely was not disappointed! There were a lot of characters in the novel to keep up with, but I found myself having quite a few favorites. The three triplet queens were all interesting, and each so different from each other, which I loved. My favorite character in the novel is, in fact, not one of the queens at all. Jules is really, really awesome, and I really hope we see even more from her in the next book. I have high hopes to, anyway! The storyline for the book was a lot darker than I expected, but I really enjoyed that, and there were some bright spots as well. I setting and the descriptions in the book were so well written, I could picture everything so perfectly. The book ends in a way that leaves me very much wanting to get my hands on the next book. I have SO MANY questions, and I really, really need the answers. I'm super curious to know if this series is going to be a duology, or a trilogy. I'm hoping for a trilogy, since there are, in fact, three queens, but would be happy with a duology as well! 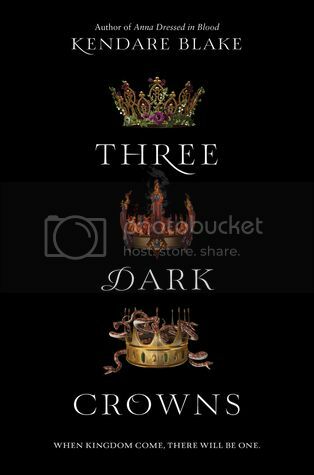 Overall; I enjoyed Three Dark Crowns so very much, and I need to get my hands on the next book ASAP! I need to know what's going on, and what's going to happen next. 2017 just can't get here soon enough! If you're in the market for a dark-reading fairytale story, definitely check out Three Dark Crowns!